DDR2 is a memory architecture that enables systems to improve performance and reduce power consumption. The amount of RAM you have determines how many programs can be executed at one time and how much data can be readily available to a program. It also determines how quickly your applications perform and how many applications you can easily toggle between at one time. Simply put, the more RAM you have, the more programs you can run smoothly and simultaneously. 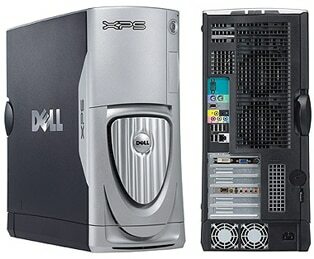 The XPS 600 supports up to three hard drives, each with up to 500GB* space - a potential capacity of 1.5TB*. And with RAID 1 and RAID 0 options, you can configure your storage to meet your needs, whether it's for storing large quantities of files, backing up system information and files, or improving performance with data striping. (H x W x D): 19.3" x 8.7" x 19.2"
55 TV Tuner for Media Center Edition PC required for watching live TV. Record, Pause & Play via PC requires an Internet connection for full functionality and may not be compatible with all cable systems and local broadcast signals.